Metalurg took an important point against Dinamo Minsk few days ago which secured them the L16 phase of the EHF Champions League, but the team could not cope with strong and motivated Meshkov Brest side on Tuesday. Meshkov Brest were leading throughout most of the game, and in the deservedly won with 27:24 (15:12). The victory now puts them on the 3rd place with 27 points, while Vardar is 4th with 25 points and a game in hand, while Metalurg are at 25 points as well, with four rounds left. Dmnitry Kamyshnik led home side with 6 goals from 11 shots, followed by recent arrival Rastko Stojkovic with 5 points from 7 shots. Dejan Manaskov was Metalurg’s best with 5 goals. 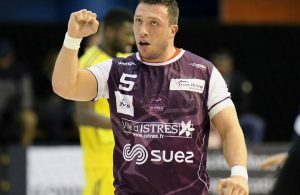 Next Story → Miha Zvizej stays in FENIX Toulouse!